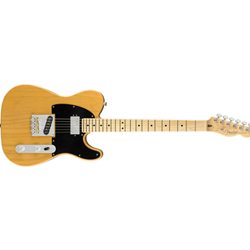 Limited Edition American Professional Telecaster Shawbucker Humbucker/Single Coil in Butterscotch Blonde. This is a limited run guitar, once they are sold out, we will not be able to get more. Fender is guided by one clear, simple directive: make life better for musicians. While the original Telecaster certainly did that (and then some), we weren’t content to rest on our laurels. Our team of mad scientists examined every component in near-microscopic detail. If we were able to improve it with a new design or modern materials we did; if it didn’t need improvement, we left it alone. When the wood chips and solder fumes settled, what was left was the American Professional Telecaster--everything you need to play your best.